I know I’ve got a winner when my daughter begs me to let her wear the project to school. She didn’t even want to wait for the tote to dry! 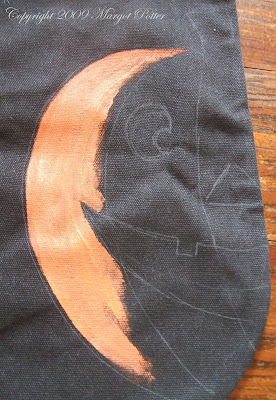 I made a series of sketches with half images of iconic Halloween items: a skull, a bat and a jack-o-lantern. 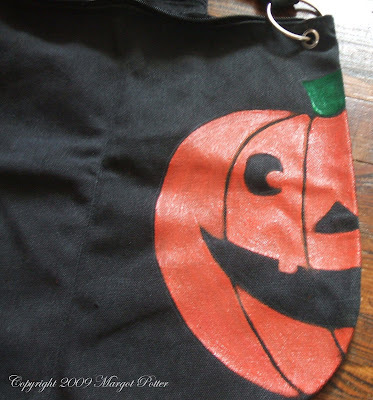 I decided on the jack-o-lantern, but I may revisit the other images. These half images have been showing up all over the place lately, so I thought it might give a ‘cute’ project just a little edge. My daughter is finished with trick-or-treating but she’s got a party to attend and she loves wearing Halloween themed t-shirts. 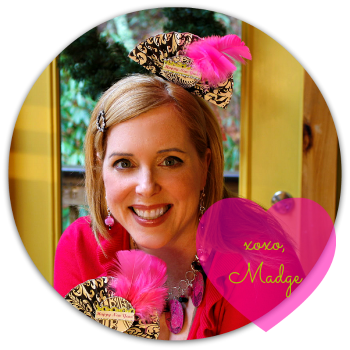 I thought this would be a fun way to look stylish and seasonally apropos. I may sport this bag myself, you never know! 1. 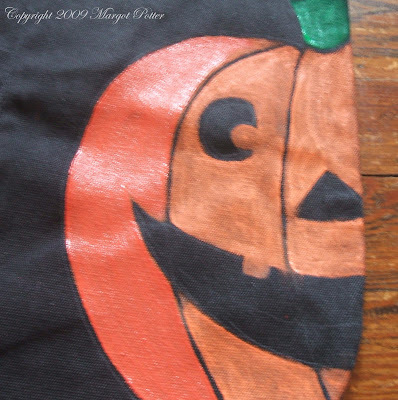 Hand draw half of a jack-o-lantern on the right side of your purse using a white marking pencil or gel pen. 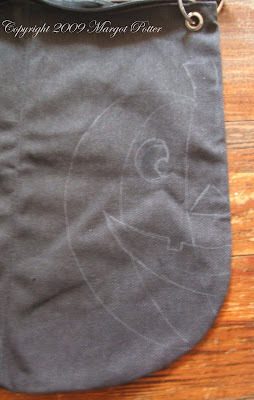 You can opt to use a template if you prefer, you may need to size the image on your computer to fit the dimensions of your purse. 2. Mix equal parts red and yellow Crafty Chica paints to make a deep orange. 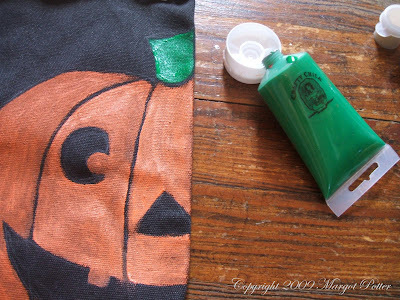 Paint a layer of orange and allow to dry. Use a fine tip brush for details and the flat tip brush for larger areas. 3. Paint the stem green. Allow to dry. 4. Paint a second layer of orange. Allow to dry. 5. Use black paint to cover any white lines left from your pencil. 6. 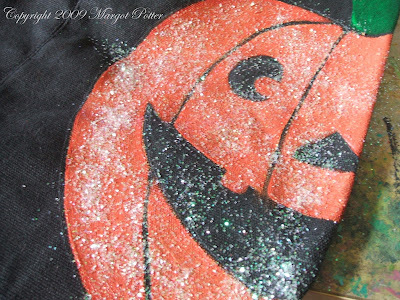 Paint a layer of dimensional glitter on purse and sprinkle clear crystal glitter on it. 7. Shake off excess glitter and allow to dry. This is too adorable. I'd carry that bag, too. wonderful tutorial - thanks for sharing. Very fun and so simple too! I love it. Beautiful! I love the half-image concept - it really punches up the design. I'd carry it! I love that you sprinkled the glitter on it,it really sets it off!